Stacey Price, Kyara Darcy and Scarlett Darcy with ATOD Examiner from Queensland – Bonnie Muir. This week, dancers and teachers from one of Medowie’s dance studios attended an ATOD (Australian Teachers of Dancing) dance workshop course in Sydney. 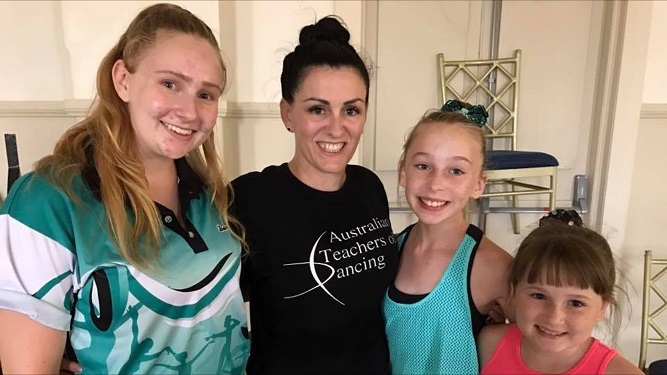 Corynne Darcy, Principal of Dance ‘n Dazzle Studio, and students Stacey Price, Kyara Darcy and Scarlett Darcy attended the ATOD dancing seminar in Croydon last Wednesday. They were able to perform in workshops in Jazz, Tap and Musical Theatre with other dance teachers from all over the state. They had the chance to learn new choreography and revise technical and safe dance practices as well as come together to share ideas, pedagogy and performance practices. “We like to stay up to date and fresh with our ideas, themes and choreography so that we, as teachers, can continue to share our knowledge with our students”. “Being an accredited teacher through ATOD has enabled my students to participate in examinations in Jazz, Classical Ballet and National Character annually,” she said. These exams ensure students’ progress with their dancing, promote safe dance practices, encourage students to work hard for their goals, improve confidence, technique, flexibility and overall fitness. They also permit students to eventually become accredited teachers themselves one day, should they desire to do so. “I have completed nine Jazz exams, and only have three remaining to be fully accredited,” she said. The next round of exams for Dance ‘n Dazzle students will take place in August this year.